The first Europeans to reach the area that is today Missouri, were Father Jacques Marquette and Louis Joliet who explored the Mississippi River in canoes in 1673. The area was claimed for France, as part of the Louisiana Territory in 1682 by Robert Cavalier. In the early 18th century, European immigrants accompanied by black slaves began to arrive in the area. The French constructed a fort, Fort Orleans in 1724 on Missouri River. Spain gained control of the region in 1762 by the Treaty of Fontainebleau, but did not assume control until 1770. The territory was however returned to France in 1800, who then sold it the United States in 1803 as part of the Louisiana Purchase. In 1804, the Lewis and Clark Expedition set out to map the region, and in 1805 the Louisiana Territory was organized. When Louisiana became a state in 1812, the remaing Louisiana Territory was renamed the Missouri Territory. In 1818, Missouri requested admission to the Union as a slave state. This was a difficult political problem because of the delicate balance between free and slave states. However the 1820 Missouri Compromise allowed Missouri's admission along with Maine's (the latter as a free state), and Missouri was admitted to the Union in 1821. When Missouri was admitted to the Union, its western border was a straight line, however in 1836, additional land was acquired from Native American tribes (the Platte Purchase) which added additional land to the Northwest corner of the state. Joseph Smith, Jr. leader of the LDS ("Mormons") claimed to have received a revelation that western Missouri would become Zion, a place of gathering. Many Mormons came to the area, but were resented by other state's existing inhabitants who, unlike the Mormons, were slaveholders. There was considerable friction during this time, including violence and Smith being jailed, and in 1839 Smith and the LDS moved to Illinois. In 1848, when the California Gold Rush begun, Missouri became an important departure point to the West, gaining the nickname "Gateway to the West". At the start of the American Civil War (1861), Missouri voted against seceding from the Union. However, there sympathies for both sides within the state, and secessionists did try to form their own state government. There were many battles in the state, and in 1865 Missouri abolished slavery, doing so before the US adopted the 13th Amendment (abolishing slavery throughout the United States of America). THIS BOOK IS PUBLISHED BY MISSOURI LIFE MAGAZINE AND DISTIBUTED BY THE UNIVERSITY OF MISSOURI PRESS. This book has been written in the midst of tribulation. When the authors began their work, two years ago, they had no adequate idea of the magnitude of the task which lay before them; but they know very well now. The histories of more than eight hundred pioneer families of the five counties embraced in this work are given, with the names of their children, and other matters of interest. We have endeavored to have every name and incident correct, but of course there are some errors. There are many obstacles in the way of obtaining information of this kind members of the same family frequently giving entirely different accounts of important events in their history. Mr. Rose has personally visited one or more members of each family whose history is given, and from his notes thus obtained the histories have been written. Where differences occurred in the statements of different members of the same family, we have carefully compared them and endeavored to sift the facts from each; and we feel confident that this book is as near correct as it is possible for any work of the kind to be. The delay in issuing the book has been unavoidable; first owing to the time spent in gathering the materials, and then to numerous unavoidable delays in the printing office. But the matter is just as fresh and entertaining as though it had been issued a year ago. We do not expect the reader to believe all the remarkable yams related under Anecdotes and Adventures. Some of them were given to us merely as caricatures of early times, and they can easily be distinguished from the real adventures. That’s a question Mark Moran and Mark Sceurman have enjoyed asking for years—and their offbeat sense of curiosity led them to create the bestselling phenomenon,Weird N.J. Now the weirdness has spread throughout the U.S.! 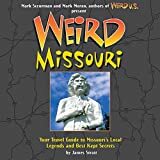 Each fun and intriguing volume offers more than 250 illustrated pages of places where tourists usually don’t venture: it’s chock-full of oddball curiosities, ghostly places, local legends, crazy characters, cursed roads, and peculiar roadside attractions. What’s NOT shockingly odd here: that every previously publishedWeird book has become a bestseller in its region. Interest in scholarly study of the Ozarks has grown steadily in recent years, and The Ozarks in Missouri History: Discoveries in an American Region will be welcomed by historians and Ozark enthusiasts alike. This lively collection gathers fifteen essays, many of them pioneering efforts in the field, that originally appeared in the Missouri Historical Review, the journal of the State Historical Society. In his introduction, editor Lynn Morrow gives the reader background on the interest in and the study of the Ozarks. The scope of the collection reflects the diversity of the region. Micro-studies by such well-known contributors as John Bradbury, Roger Grant, Gary Kremer, Stephen Limbaugh Sr., and Milton Rafferty explore the history, culture, and geography of this unique region. They trace the evolution of the Ozarks, examine the sometimes-conflicting influences exerted by St. Louis and Kansas City, and consider the sometimes highly charged struggle by federal, state, and local governments to define conservation and the future of Current River. Including a completely revised and updated bibliography, A History of Missouri: Volume I, 1673 to 1820 covers the pre-statehood history of Missouri, beginning with the arrival in 1673 of the first Europeans in the area, Louis Jolliet and Jesuit Father Jacques Marquette, and continuing through the development and growth of the region, to the final campaign for statehood in 1820. In tracing the broad outlines of Missouri's development through the formative years, the author examines the origins of Missouri's diverse heritage as the region passed under the control of French, Spanish, and American authorities. During the Civil War, only Virginia and Tennessee saw more action than Missouri. Ulysses S. Grant first proved his ability there. Sterling Price, a former governor of Missouri, sided with the Confederacy, raised an army and led it in battle all over the state. Notorious guerrilla warriors "Bloody" Bill Anderson and William Quantrill terrorized communities and confounded Union military commanders. Brian Warren and Joseph "Whit" McCoskrie provide a chronological overview of more than three hundred of the documented engagements that took place within Missouri's borders, furnishing photos, maps, biographical sketches and military tactics. A History of Missouri: Volume VI is the final volume of A History of Missouri. Beginning at the close of the Truman presidency and ending in 2003, the two hundredth anniversary of the Louisiana Purchase agreement and of the organization of the Lewis and Clark expedition, Volume VI explains how modern Missouri bridged the years between the mid-twentieth century and the new millennium. Central to the period was the end of segregation, the demise of bossism in Kansas City and St. Louis, changes in the economy, and the impact of cross-state urbanization. Among other developments were the building of the interstate highways and the marked expansion of higher education. Larsen’s overall thesis is that during these years Missouri continued to advance in a restrained manner and at a moderate pace. The Republican party revived, suburbs mushroomed around the central cities, the state government grew and expanded its functions, the population became more diversified, concerns increased for the natural and built environments, higher education was transformed, small towns held their own, and the state declined as a force in national politics. A History of Missouri: Volume VI, 1953 to 2003 is very much a pioneering effort and one that should be welcomed by anyone interested in the history of Missouri, from casual observers to policymakers. Now a large number of the French inhabitants of Kaskaskia, Cahokia, St. Phillipe and Fort de Chartres in the eastern Illinois country, cross the Mississippi to escape the dreaded English rule, and find a new home in the possessions of Spain. This emigration gives the first impetus to the growth of population in the western Illinois country now Missouri leading to the formation of new settlements and villages, and to trace the growth of these settlements and the business and ancestry of these settlers is a subject which must always interest us.